whose support has been immense and has meant that the amazing medals are possible! Earlier in the year, happy Harrier Tracey took part in Love to Ride – a cycle challenge aimed at getting non-riders back in the saddle and existing riders riding more. When I first got the email from Love to Ride telling me to check the website as I had won a prize, I was expecting it to be a cycle helmet or similar. To see that I had won such an amazing prize left me almost speechless – hard to believe, I know! Due to busy diaries, the soonest we could get it booked in for was the last weekend in October. Our hotel, the Copenhagen Island Hotel, looked amazing and was specifically chosen for it’s proximity to a parkrun – there are three in Copenhagen. The flight out was not to my liking, got to be honest! I’m a nervous flier at the best of time but when we boarded the plane two hours late, we were told that there was a fault with the plane meaning they couldn’t start one of the engines properly and would have to use an air-jet to get it going…. this didn’t help my anxieties! We finally landed, two hours later than anticipated, in Copenhagen and got the train to the main station. Stepping out of the station for our first glimpse of Denmark, the first thing we saw were bikes. Everywhere. Directly outside of the station was a huge mass of bikes of every shape and size. Some were chained up, others just seemed to be dumped there. We set off walking to the hotel – despite it being close to midnight it was a pleasant, balmy evening and the city still seemed very much alive. Directly opposite the exit from the train station was Tivoli Gardens, an amusement park right in the middle of the city, and this was so brightly lit with people pouring out of the gates, screams of joy and terror from the rides. It was hard to believe that it was so late and that Friday night in my home town would be full of little more than stumbling drunks. Heading out of the city centre there were still many people around and so many on bikes! Despite being aware that cycling was big in Copenhagen, I was still amazed that there were so many people on bikes at that time of night, so many bikes at the side of the road leaning against houses, against trees, against each other. We reached our hotel which is surrounded on 3 sides by water – hence the name – and immediately spotted two bike-parks full of bikes at the entrance. On check in we asked how to go about hiring them and were told to simply book them at reception the next morning as they have plenty. Ready for bed after around 12 hours travelling we made our way to our room and settled in. The room was beautiful but the view was of the busy road junction outside rather than the more scenic river panorama on the other side of the hotel but again I was struck by the number of people riding past – now in the early hours of the morning! Saturday morning dawned all too soon and we dragged our weary selves out of bed to prepare for Amager Faelled parkrun. I had sussed out roughly where it was and we debated hiring bikes to get there but as we weren’t familiar with the area we didn’t know if there would be somewhere to chain the bikes up or if it was a good area. Instead we took off on foot and arrived very early at what we hoped was the right place in the middle of a pretty but fairly landmark-less park. Eventually a guy on a bike – of course – turned up and directed us to a grassed area further down the path where after 10 minutes or so, other runners started to congregate. If not all, then 99% of them, acknowledged us on the way past and I was reminded of a comment made by a Danish friend of mine who proclaimed that they are the friendliest race on earth. At this point, I wasn’t inclined to disagree! The parkrun briefing began – in Danish of course! – and I was struck by how few people were there compared to the crowds I am used to at Tees Barrage and Albert parkruns. After a lot of laughter for jokes that we didn’t understand – it was clear that there was a lot of familiarity and camaraderie among the regulars – the Run Director asked in English if there were any runners from abroad. Along with Matthew and I there was a guy from down south who was running his third or so run here, having spent a period working in the area. Walking to the startline, a lovely lady chatted to me and told me about a 10km and half-marathon taking place the next day. With my usual level of enthusiasm, I was tempted by the 10km and asked whether it would be flat. She chuckled and pointed out that most of Copenhagen is flat! Setting off on the two-lap course, I realised quickly that she was right – looking around I could see a couple of large hills within the park (and how I hoped we weren’t running over those!) but other than that, everything seemed to be on a level plane. I completed my two laps – not a fantastic time (around 31 mins) but given the stresses of travel the day before and lack of sleep I was pretty happy with that! As it was Halloween, there was a lady dressed as a witch who was putting hexes on runners as they passed on the first lap and again when they finished. Aware that I was English, she spoke mine in English. I can’t remember what it was but it was complimentary and made me smile for the second lap. It was fantastic to see someone so enthusiastic and so inclusive and as I stood waiting for Matthew to finish (where is he, surely he should be almost done by now?!) she approached me and offered me some water from a half-empty bottle which was sat on a plate with a goblet. She said that the bottle hadn’t been drank from and that the 100 runner had already had his drink. I must have looked a little puzzled as she went on to explain that it is their tradition when reaching 100 runs (and maybe other milestones, I didn’t ask! ), the runner gets to drink bubbly from the goblet… but as they are cheap (her words 🙂 ), it’s sparkling water. This seemed like such a lovely gesture, a fab little ceremony to mark the occasion! 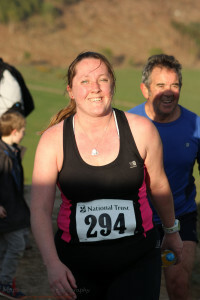 Grateful for the drink, I accepted and while chatting, kept an eye on the finishing straight (seriously, where is he?!) and she told me about Copenhagen’s parkruns and the comparisons that she has drawn with Bushy parkrun – the birthplace of parkrun and one that is many times the size of this one. Before she left, the lady I had spoken to at the start spoke to me again and commented that I had chosen a good time to come as they were having unseasonably warm weather. I was, at this point, stood in just running vest and shorts and while not exactly tropical, it wasn’t cold either. Finally, I saw Matthew in the distance (at last, where has he been?!). Eventually making it over the finish line, I joked to him “did you get lost? !”… err, yes… he had! Unlike the parkruns we have done before that have high-viz marshals at every turn, Amager Faelled parkrun runs on a tiny volunteer group and so the route is marked with arrows drawn from flour on the ground. While this is fine for the majority, my not-very-observant husband missed one of the arrows and ended up running an extra kilometre in the wrong direction before making it back to the correct route! While not too put-out by the distance he was most aggrieved that he would have achieved a PB had he not have got lost! We headed back to the hotel for breakfast, having worked up an appetite from the 5km run and similar distance round-trip walk there and back. Once we had filled up and freshened up we went to book our bikes for the day from reception but…. “sorry, we’ve sold out” … what?? But you said there would be plenty! She assured us that there would be plenty available again the next morning so a little put-out, we headed out on foot instead. From the hotel, there is a lovely stroll along with river and about half a mile or so from the hotel we found a fab fitness area with ramps and steps for hill training, pull up bars and much more. In the crisp autumn air, I could picture it full of people exercising but there were none to be seen, just other curious tourists. One thing that struck me, though, was the number of runners. Prior to parkrun, we hadn’t seen many but on the way back to the hotel and for the rest of the day – and indeed the whole weekend – there was just a constant stream of runners. The only place we didn’t see them was right in the centre of the shopping district but everywhere else seemed to be full of them! Heading into the town we visited Hamleys and had lunch then went to Tivoli Gardens. I had read online that it would be full of the halloween theme and as you can buy a ticket just to walk round, not to go on the rides, we decided to have a look. Unfortunately, it wasn’t as spacious as we had believed so we spent half an hour being jostled about by over-eager families trying to queue for rides before giving it up as a bad job and leaving, heading instead to the Carlsberg Brewery tour for a bit of history and alcohol. Having missed the last free transfer bus back to the town we decided to walk the couple of miles back to the hotel and on the way we commented on the number of bikes we had seen. There were so many shapes and sizes of bikes, so many different riders from young children tagging along behind parents to older people, students and business people. All seemed equally comfortable on the roads and completely at home with the traffic lights and road markings. Despite our first weekend as a couple without the children in… ever…. we had dinner in a buffet type restaurant then headed back to the room where Matthew fell asleep by 9pm and I caught up on my book! We’re so rock and roll! First thing on Sunday morning, we dashed to reception to ensure we got bikes for the day before heading for breakfast then we went to meet our steeds for the day! Throughout Saturday I had been fascinated by the number of bikes that seemed unsecured but we realised that the majority of them had a security device built into them which is attached to the rear of the bike and puts a bar through the spokes of the wheel meaning it the wheel can’t turn and so can’t be ridden. This doesn’t, of course, stop someone picking the bike up and walking off with it but given the number of bikes laid around the city, this doesn’t seem to be too much of an issue! Right next to the hotel, weaving between it and the nearby Fisketorvet Shopping Centre (which is known to the locals as the slightly less classy sounding Fish Market), is the Cykelslangen – The Bicycle Snake. 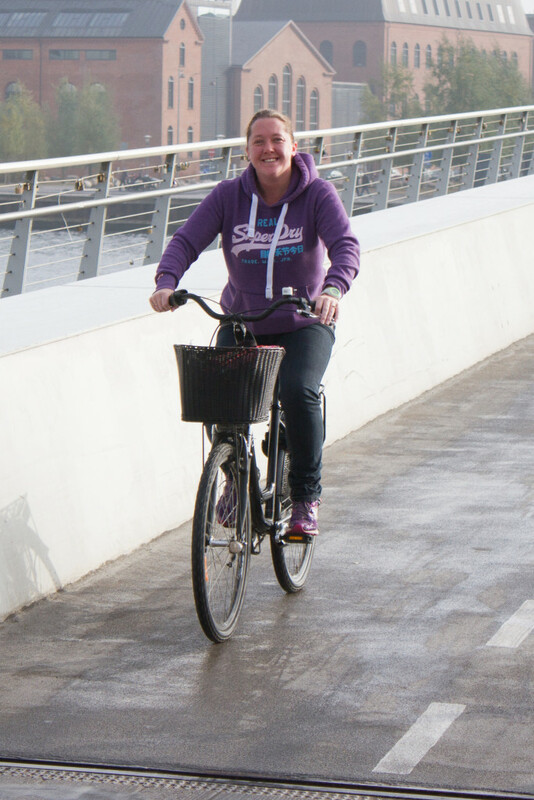 The modern looking bridge, opened in 2014, is open to bikes only and links mainland Denmark with the other half over the river via the Bryggebroen which is a bicycle and pedestrian bridge. On the whole, people seemed to respect the rules, though we did see a few runners using the cycle-only Bicycle Snake bridge. 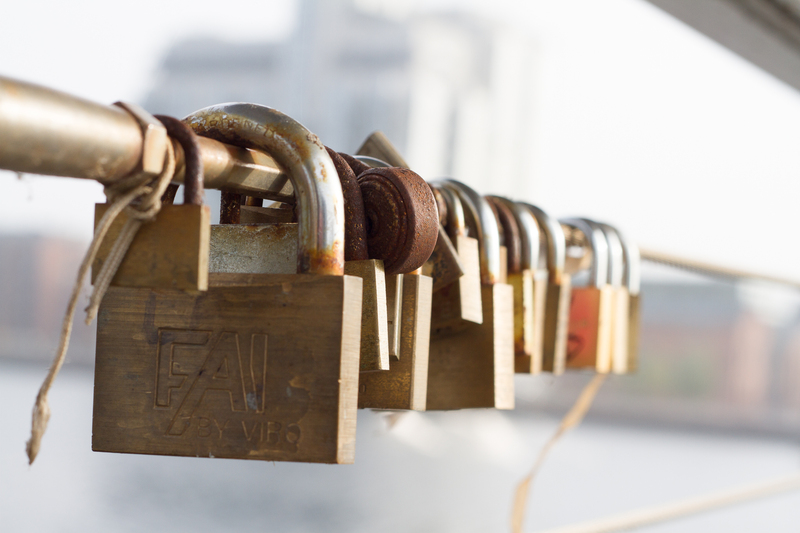 The Bryggebroen attracts the same tradition as the Pont Des Arts bridge in Paris where lovers attach padlocks as a sign of their love. In addition to the padlocks however, there were a splattering of bike locks and a large amount of baby dummies. I’m not sure on the meaning of these but given the quantity I wonder if it is where parents take them when the child is ‘giving them up’ ? We cycled over the bridges and back, acquainting ourselves with the unfamiliar bikes including the gears and brakes. Matthew commented that the bikes only had front brakes… I soon found the rear brakes (around the time I fell off!). To use the rear brakes, you pedal backwards! So while free-wheeling you are ok, but the second you put any backward motion on the pedals you do the equivalent of an emergency stop! Heading along the river on the same route we had walked yesterday, we got into the swing of things and I enjoyed the feeling of the wind in my hair and the freedom of not having to worry about whether the kids were safe or if they were about to wobble into the river! Soon though, it was time to face a big fear of mine – riding on the road. Copenhagen has many roads where there is an entirely separate lane for bikes but on some of the smaller rides you share with other road users as you would in the UK. While walking around the city on Saturday I had tried to acquaint myself with the rules of the road but some things were still a mystery, mainly related to the traffic lights – bikes going through pedestrian crossings mainly! I wasn’t sure if this was bad riding as is frequently seen in the UK where bikes hurtle through red lights with no regard for pedestrians, other traffic or their own life or if it is common practice (similar to in France where you can turn right on a red light if there is an amber light and you yield to pedestrians… or something!). For the first couple of miles I did ok, but emerging from a traffic free area near the Parliament building to a busy junction I had to take minute to watch some of the frequently passing cyclists to see how they approached it and what road signals they heeded. 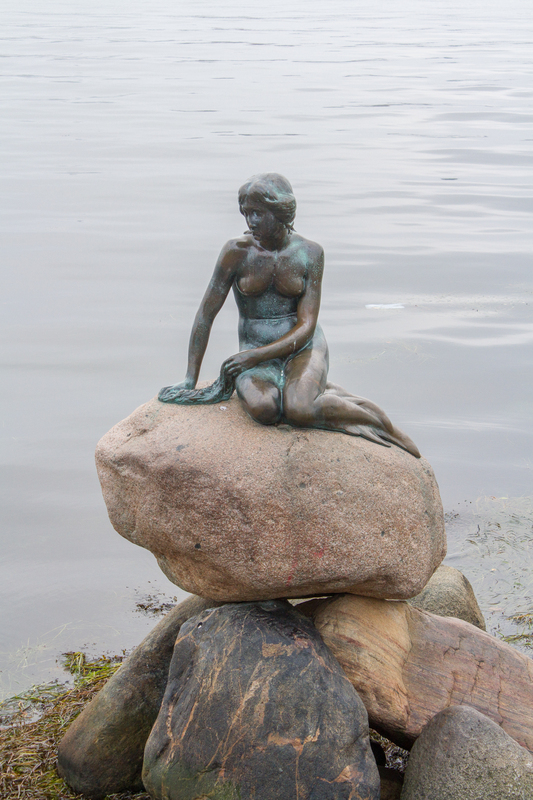 Eventually I went for it – and survived – and we made our way to the Little Mermaid statue which I had been pre-warned was a little under-whelming! From here we cycled to the nearby Kastellet where we obeyed the signs and left the bikes parked while we walked around the ramparts – not everyone followed this though and we had to move out of the way of people riding round plus a zillion runners! Riding back into the main town, I spotted a department store which was full of Christmas decorations so we stopped to take a look around. Having seen the bike parking outside, I’ll never complain about trying to get parked in town near to Christmas ever again! Along from the department store is Strøget – the Walking Street. This 1.1km road filled with shops is the longest pedestrianised street in Europe . Pushing the bikes along wasn’t a pain, but I was reluctant to leave them parked outside shops – even with the security devices and the hotel name emblazoned down the side – but we popped in and out of a few and then stopped in an open square at an open-air bar for a much needed glass of hot mulled wine. The weather was now getting quite chilly but the bar had halogen heaters over each table and blankets. It was amazing sitting there watching the world go by while staying toasty warm! As I watched the evening start to draw in, a moment of panic set in – what about bike lights?! Fear not – the bikes come equipped with lights which are automatically triggered by your pedaling. Eventually I had to admit that the time had come to call it a day and head back to the hotel and return the bikes. Amazingly, I made it back in one piece managing to not get knocked off, run over, arrested or lost! For those who know me, I’m sure you’ll agree this was an achievement! Heading back through the airport (for a slightly less eventful journey home!) I couldn’t resist picking up a little souvenir of my trip and I look forward to wearing it out on my bike. I fell in love with Copenhagen. The place is beautiful and the people are so friendly. I’m not well traveled and certainly haven’t visited many cities but it’s the first time I have visited somewhere and thought “I could live here”. My employer, Darlington Borough Council, does support cycling staff with bike sheds, showers and lockers and the Cycle to Work scheme and there are cycle paths dotted about both in Darlington and in my home town of Stockton but there is no way I could contemplate my 25 mile round trip by bike here. 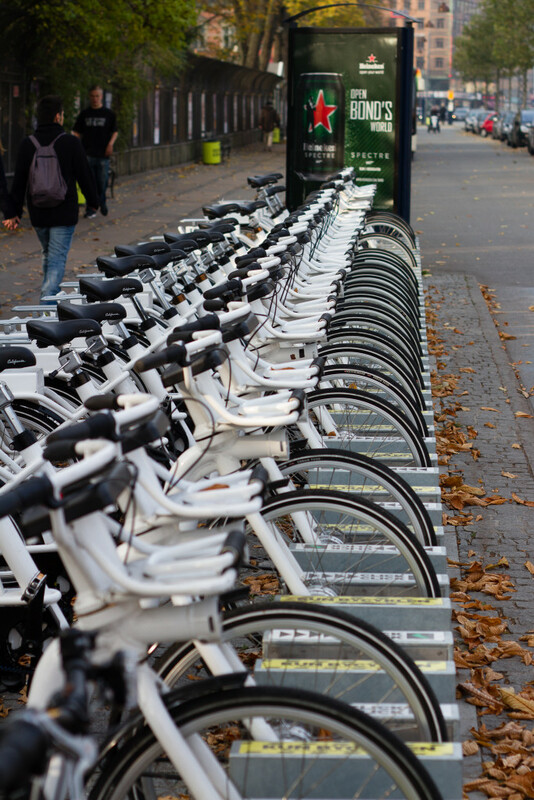 England could learn a lot from Copenhagen’s attitudes towards cycling. I did wonder, idly, whether everyone in Copenhagen embraces the cycling way of life or if there are many who find cyclists an irritation as has been seen in Oxford. Perhaps cyclists and motorists give each other more consideration than in the UK? There certainly wasn’t any blasting of horns or gesturing out of windows, nor did there seem to be too much of an issue between pedestrians and cyclists. Whether you are into cycling or not I would highly recommend Copenhagen. There is plenty to see and do, the air feels fresh and clean and the atmosphere is just lovely! A windy morning didn’t put off a hardy troupe of Harriers who made the weekly pilgrimage to the startline. Michael CURRIE 24:45 52.19 % First Timer! Adrian HUGHES 26:15 49.14 % New PB! A new route proved slightly more challenging but still no hindrance for the Harriers who ignored the forecast for heavy rain and were rewarded with ideal weather conditions for a pleasant race. The alteration in the route from previous years was a bridge at 4km which had to be crossed before looping round the roundabout and going back over. A cruel and unusual twist, but every Harrier dug in to get over, round and back again! The rewards were the usual t-shirt and medal plus the random addition of a large box of cereal! What a gorgeous morning for a parkrun! Albert Park was teeming with runners for it’s 7th birthday celebrations which saw Julie Berriman crowned the top lady for the year, having accrued the most points! It was a milestone day too with Oliver W getting his 10th run and Tracey finally cracking her 50th! The PBs, however, were in short supply with many holding back ahead of tomorrow’s Middlesbrough 5km. This didn’t stop Oliver from marking the event with another PB making it 3 in a row! Oliver WRIGHT 30:59 57.45 % New PB! Steph COTTON 46:24 31.90 % First Timer! Despite hating hills (and often hating running in general!) I was talked into a 5 mile race up and over Roseberry Topping. Having lived in Teesside all my life, I am not a stranger to this landmark and had most recently climbed to the summit with the children. The evening was beautiful – sunshine but not too hot and I was looking forward to taking in the view from the top, though less keen to actually get up there! I met two friends in the car park – runners from Elvet Striders who seem to find this kind of thing fun! Soon we were at the start line which was on the rough path which leads from the car park. A gentleman positioned himself at the back and announced he was the back marker – I went and introduced myself as I suspected we were to see a lot of each other! The race started with an uphill incline – within a few hundred metres several people were already walking! However, once through the gate at the top of the path it levelled off and even had some downhills….. but of course, what goes down must go, erm, up! The route was beautiful and took me through places I had never seen before! Previously I had gone straight up and straight down so the woods were a revelation to me! Soon it became clear that we were heading up and I had to resort to walking several times. Up….up… up we went, then I glanced to the right and there, in the distance, was Roseberry Topping. Wait…. what??? I have to admit to feeling a bit defeated at this point! What on earth was I climbing if not Roseberry Topping? And how do we get up there? Still I pushed on, battling for last place by this point which I soon claimed as my own. We finally reached the summit of whatever this mound was then were greeted with a lovely downhill stretch which I would have enjoyed more had I not been facing the task of scaling the back of Roseberry Topping! We came across past a folly then the real uphill work started again. I was pleading with my legs by this point as I started to grind to a halt and watched the people ahead of me get further and further away. Finally a voice called out “come on mum, you can do it” and I looked up to see my younger son peering over the edge at me. Matthew was perched on the top with his camera ready to capture each runner as they made it to the top and I was less than delighted with many of the ones of me! Oliver, my younger son who had given himself the task of mini-marshal in the absence of any marshals on the summit, directed me to touch the trig-point (or white thing as I prefer to call it!) then it was onto a long downhill. My pleasure at this was short-lived when I saw the potentially ankle-twisting stone which lined the path and I didn’t feel confident enough to do it at any great speed. Eventually though, the terrain cleared a bit for me to pick up the pace and I soon caught back up to the runners ahead of me….. but only until we hit yet another hard uphill! Having down several trails now, I am getting more confidence at letting myself go on the downhill stretches so once again I was able to catch up with the people ahead of me but didn’t quite have enough in the tank or the space on the path to get past them. Finally, the last stretch was ahead of us and my stubbornness and pride kicked in giving me the boost I needed to pull back two places on the final stretch. I felt a little guilty about this but at the end of the day, it is a race! As I said at the start, I hate hills so I went into it knowing I was going to find it hard. However, it was a beautiful, varied route and I would probably do it again. My final time was 1:16:29 – certainly not my fastest 5 miles! A busy day at Albert parkrun saw the usual display of fantastic results including 3 new PBs set! Next week at Albert Park there are several celebrations, most notably the event’s 7th birthday and Tracey’s 50th parkrun and Oliver’s 10th parkrun! Make sure you are there to partake in the cake! The mini-Macks appear in the volunteer list – well done! Stephen DEVEREUX 22:28 57.57 % New PB! Ged HALL 22:42 71.29 % New PB! Adrian HUGHES 26:28 48.74 % New PB! Halfway through May and the weather was a little more appropriate for the month than it has been recently! 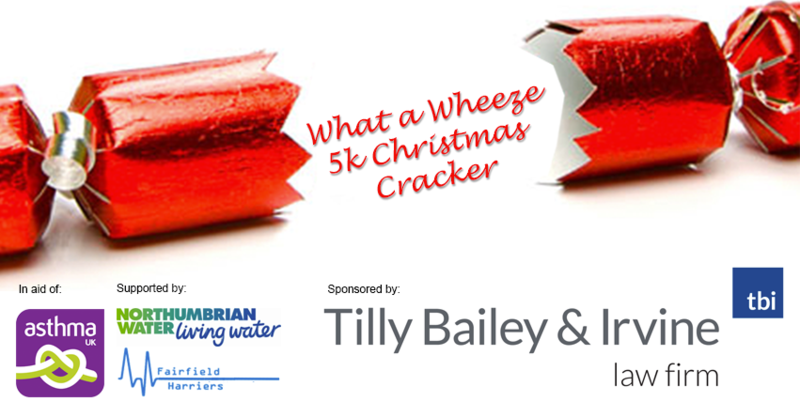 Results below – The majority of runners seemed to be at Albert Park but there are a few regular names who are missing from Tees Barrage and Sedgefield… shout up if you ran out of area so we can add your results in!! This week, mini-harrier Oliver set another PB SMASHING almost 6 minutes off his previous PB at Albert Park and Ged gave his PB a good tickling taking another 4 seconds off and planting himself firmly into the 70% age-bracket. Laura was just 10 seconds off her PB and Stephen was tantalisingly close too. Well done to Laura for her 150th run a couple of weeks ago (now at a fabulous 152) – while not an official Milestone, it is certainly an achievement!! On the topic of Milestones, there will be a ‘milestone party’ on 30th May at Albert to celebrate Tracey’s 50th and Oliver W’s 10th. Ged HALL 22:55 70.62 % New PB! Oliver WRIGHT 31:13 57.02 % New PB!